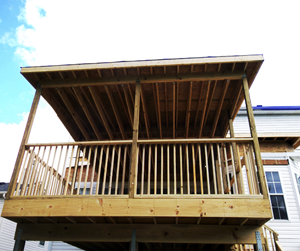 Covered Deck, Siding, Gutters & Roof: Lexington, Ky.
Another outdoor summer project is in the books! Members of the Superior Home Improvements home remodeling crew wrapped up a covered deck project last week, installing its siding, roofing, gutters and ceiling! To view more of our recent roofing, exterior remodeling and interior remodeling projects, click here. Deck Cover, Siding, Gutters & Roof: Lexington, Ky.
Porch Extension, Roofing and Vinyl Siding: Winchester, Ky. This week, members of the Superior Home Improvements exterior remodeling and roofing crew completed a decking/porch extension, roofing and vinyl siding project on a home right down the street from our office in Winchester, Kentucky! To view a full photo album from this project, click here. As warm weather is right around the corner, the deck installation projects are coming in! 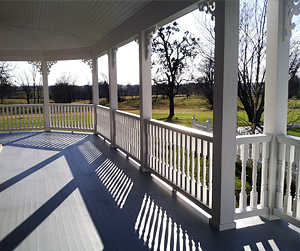 To the right is a photo from a recent deck project completed by the Superior Home Improvements exterior work crew. To view more pictures from this project, click here! Backyard Deck Project: Wilmore, Ky.